It's the Weekend. Let's Eat. It's the Weekend. Let's Eat. Gilbert. At Expedition Foodie, we're all about giving you reasons to travel for a good meal. "It's the Weekend. Let's Eat." 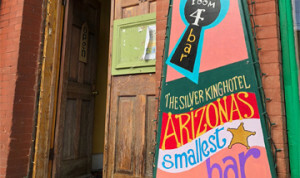 features itineraries for where to dine and what to order in cities throughout Arizona. This edition takes us to Gilbert in the greater Phoenix area. It's not exactly accurate to call the Gilbert dining scene an overnight success, even though it sort of seems that way. Over the years, Gilbert's Heritage District has transformed from a sleepy center in suburbia to an exciting food hub—a concentrated restaurant cluster where you'll likely run into a waitlist morning, afternoon and evening. While those who've visited infrequently might be surprised by the hubbub that's "suddenly" emerged, locals know that the dining scene has been a long time coming. In one weekend, you can embrace the delicious results. You won't be the only people eager to trek into Arizona Wilderness Brewing Co. on a Friday night. Arrive early to take in the crowd of happy campers cheering with foam-topped craft beers and munching on share-sized meals. The menu is inspired by the great outdoors, with items like "After the Hike Burger" or "Wild West Grilled Cheese." Classic Southwest ingredients such as green chiles, roasted red peppers and pulled pork find their way into most dishes. Plus, for spice fans: jalapeños, in all forms—sliced, diced, roasted, jellied, stuffed with scallion cream cheese and stuffed into meatloaf. Cool off with a signature in-house brew. Arizona Wilderness is famous for its sour beers, such as the Blood Orange Gose and Grapefruit Gose, both made with citrus from The Farm at Agritopia. Why limit yourself to brekkie choices from just one place? Hit up the Gilbert Farmers Market—a bustling open-air market held every Saturday morning—to nosh around. Bergies Coffee Roast House is a favorite for small-batch java from Central and South America, Africa, and Indonesia. At AZ Food Crafters, go savory with flaky-crust hand pies stuffed with grass-fed beef chorizo, caramelized onions and farm-fresh scrambled eggs. 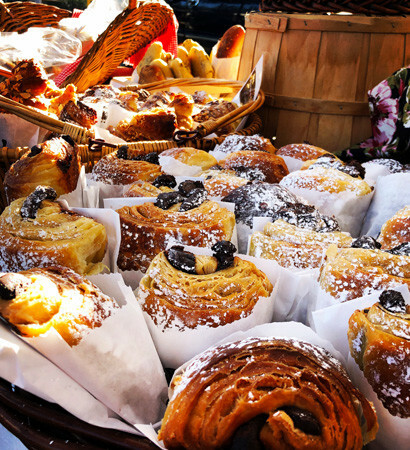 Or, go sweet with a French- and Swiss-inspired treats from La Belle Vie Bakery, like the caramelized apple and cinnamon-flavored Kouign Amann Tatin. Radish supplies cleverly named fresh-pressed juices, such as the Kale Me Maybe. Grab a loaf of bread from Proof and a jar of prickly pear jelly from Carolyn's Classics for a delightful double-vendor whammy. The food at Joe's Farm Grill lands somewhere between healthy hipster and outdoor picnic: basically, no-fuss favorites that are gussied up a bit. Take, for example, a burger. Here, it's stepped up with roasted red peppers, grilled mushrooms, farm-made pecan pesto, and imported fontina. While there's no pasta or potato salad here, there is the BBQ Chicken Salad mixed with fresh herbs, roasted corn, poblano peppers, and crispy fried tortilla strips. Dining at Joe's Farm Grill is a team effort. While one person orders, another should be ready to pounce on an empty outdoor picnic table. This is a popular Gilbert destination, especially for families who alternate between games of tag on the grassy lawn and bites of food. 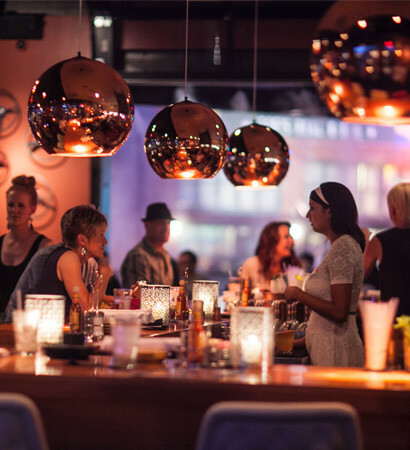 Joyride Taco House is more fiesta than siesta, with an atmosphere that can only be described as energetic. That same zip can be found on menu items: colorful, flavorful, impactful. Start with the guacamole, which is Joyride-ified with tomatillo, Cholula, jalapeño, and corn. Next, bite into the Baja Fish taco, which is composed of ridiculously fresh grilled ﬁsh (yes, in the desert), guacamole, Mexican slaw, pico gringo and white magic (Joyride's term for crema). If you aren't yet convinced that the menu is anything but standard, take a sip of one of the margaritas, including flavors such as blood orange and cucumber-serrano. You'll find nothing but warmth in the industrial space that Liberty Market occupies, especially at brunch. First, stop at Strada Espresso Bar, where you'll hear several orders from others for the Cortado. This Cuban latte—made with half milk, half coffee is a creamy wake-up call. Try not to stare at what's on your neighbors' plates when you take a seat, even though it's hard to resist. The Lox and Bagel—a deconstructed smorgasbord that includes cured salmon, capers, hard-boiled egg, chives, and cornichon is almost too pretty to eat. There are plenty of vegan options at Liberty Market as well, such as the breakfast burrito smothered in tomatillo and chile pequin sauces. When it comes time to order, you might be forgiving of the wait times. You'll need every minute to decide what you want. Ivy Morris has lived in Tucson for the past five years. If you happen to sit next to her at a bar and mention you’re from out of town, prepare for recommendations on where to eat and what to do. Expedition Foodie interviews chefs, servers, mixologists, brewmasters and winemakers to uncover Arizona’s best-kept dining secrets.